Problem: CMS’s core measures or evidence based performance management, is focused on delivering the best care to the patient. Hospitals are looking to reduce mortality, morbidity, readmissions and length of stay-and be good in other areas-things like cost reduction, enhanced productivity and increased volumes. 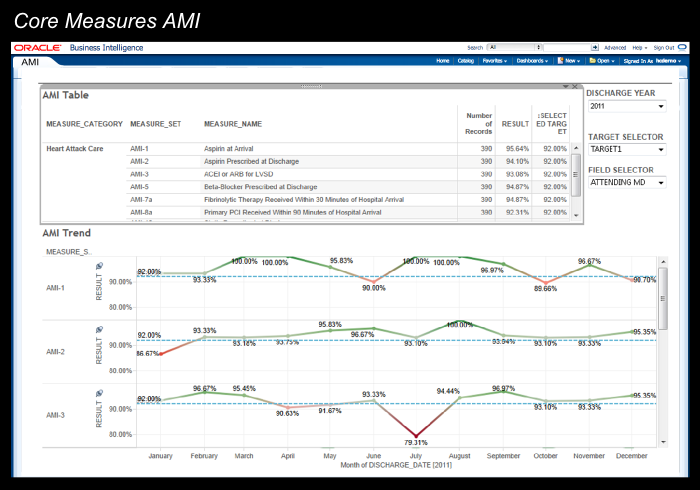 The national focus areas of: heart failure, AMI, pneumonia, and SCIP measures (surgical care improvement project) will require a transparent and agile reporting tool not reliant on your EHR vendor’s development schedule. The EHR Incentive Program for 2014 will include 29 available measures for hospital reporting, of which hospitals may select 16 on which to report. PQRI (medicare part B reporting) is relevant to hospital BI reporting to facilitate cross pollination of data on CQMS . Are you ready to abstract this data? Solution: When data lacks structure and validity the reporting of that data proves less fruitful than intended. Catalyst brings together under ‘one roof’ the ability to draw data from various disparate source systems. EHR technology is not prepared for nuances in reporting by specialty or late additions or modifications to stages of meaningful use. Catalyst provides the reporting expertise and architectural expertise in building a reporting structure that is sure to meet all of your eCQMs requirements. Result: Hospital leadership are rest assured that when it comes time to report on hospital core measures that the ability to be effective in care delivery and provide safe and quality care that is cost effective to your patients will be proven easily to not only CMS or HHS but to your payers as well. Your value proposition will be in the spot light when you can show that your hospital is doing all of the necessary technology improvements that help prove your effectiveness as a care delivery system. When you can check things off your list like, eCQMs, you can begin to focus on the most strategic aspects of growing your enterprise. You take care of the patient, we take care of proving that you did by managing the data. .